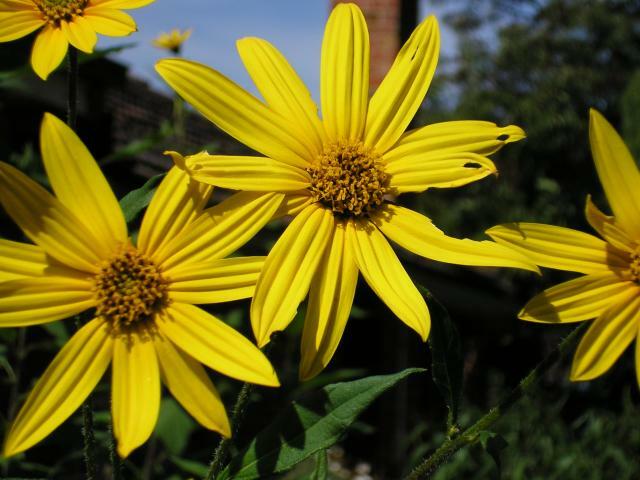 The Jerusalem artichoke (Helianthus tuberosus L.) is an erect, rhizomatous perennial herb, up to 3-4 m high. Though perennial, it is mainly grown as an annual. It is a highly variable plant: many characteristics, including size (2 to 4 m), tuber colour (green or violet), stem number and the number of branches per stem depend on genetics and environmental conditions. The stems are generally hairy and branch in their lower part. The root system is fibrous and develops cord-like rhizomes that can reach more than 1 m in length. The apical part of the rhizome is swollen and forms a fleshy tuber. The leaves are opposite or alternate, ovate to lanceolate, toothed, pubescent on the lower surface and 3-20 cm long x 5-8 cm broad. The inflorescence is a pseudanthium borne alone or in groups at the end of the stem or on terminal axillary branches. The flower head is 5-11 cm in diameter (much smaller than that of the sunflower) and bears many small yellow tubular fertile flowers surrounded by yellow ray sterile flowers, the ligules of which are thought of as petals. The fruit is a hairy achene containing a mottled black or brown seed, 5 mm long x 2 mm wide (Kays et al., 2008a; FNA, 2006). The Jerusalem artichoke is mainly grown for its edible tubers, which vary in size and shape. Some are potato-like, small, round and knobby, while others are long, slender and smooth (Swanton, 1994). The tubers taste like artichoke (hence the common name) and are eaten raw, or cooked in the same way as potatoes. They can also be roasted and ground in order to make a coffee substitute. They used to be a staple food or an emergency food (for example in Western Europe during World War II), but are nowadays a more fashionable vegetable (Kays et al., 2008a). Unlike potatoes, Helianthus tuberosus tubers do not store energy in the form of starch but in the form of inulin, a fructose polymer used in health foods (notably for diabetics) and industrial products (Kays et al., 2008a). As a high energy plant, Jerusalem artichoke has also been used for the production of biofuels (FNA, 2006; Duke, 1983). 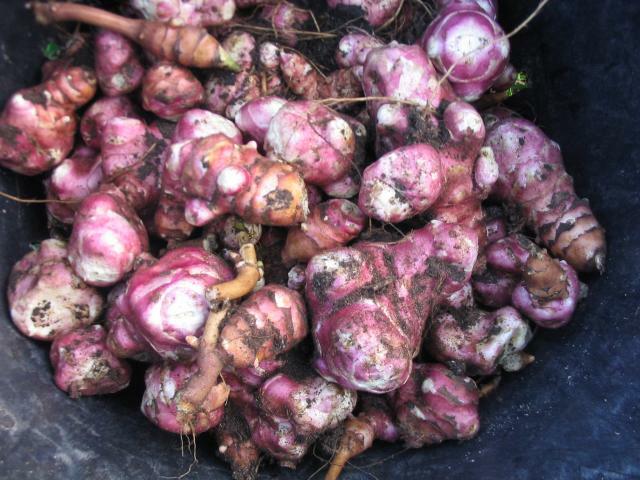 Jerusalem artichoke tubers and aerial parts have long been used to feed cattle, sheep and pigs. Parmentier, the promoter of the potato, described such uses in the 18th century. Forage can be fed fresh or ensiled, but stems from woody varieties may be unpalatable (Kays et al., 2008a; Swanton, 1994; Duke, 1983). The by-products of inulin extraction and biofuel production are not apparently used as feeds. A protein isolate is extracted from the leaves, yielding a fibrous residue that could be a potential feed for ruminants and rabbits (Kays et al., 2008b; Rawate et al., 1985; Castellini et al., 1989). The Jerusalem artichoke originated from North America. Helianthus tuberosus and Helianthus annuus (sunflower) were the only crops that were already domesticated during prehistoric times in what is now the USA. The Jerusalem artichoke is now widely cultivated in temperate areas of both hemispheres between 40° and 55° latitude. It does not well in tropical areas, especially in the humid lowlands (FNA, 2006). Jerusalem artichoke is cultivated in North America, Northern Europe, China, Korea, and it is also grown in Egypt, Australia and New Zealand. Northwards, it can be grown as far as Alaska as it is frost tolerant (Kays et al., 2008a; FNA, 2006). The Jerusalem artichoke grows in places where annual precipitation ranges from 310 mm to 2820 mm and where annual temperatures are between 6.3°C and 26.6°C. It does well in most soils with pH ranging from 4.5 to 8 and may tolerate salinity. However, it prefers loose, loamy and well-drained soils. Leaves and stems are frost sensitive but tubers survive and the plant can easily regrow from the tubers after winter. The Jerusalem artichoke is a full-sunlight species and shade hampers its growth. Though the plant is tolerant of winds, saline ones have deleterious effects. The plant does not require much fertilizer (excess N addition may even hinder tuber production). However, it tend to deplete soils, and fertilizer application is recommended after this crop (Kays et al., 2008a; FNA, 2006). The Jerusalem artichoke is a minor crop in most places and there are no FAO production statistics available (Kays et al., 2008a). Jerusalem artichoke intended for forage should be preferably harvested just before flowering as it produces the highest green top yield at this stage and becomes woody with age. In the 1980s, green top yields were reported to range between 18 and 28 t green matter/ha (Duke, 1983). More recent results referred to 40.5 t green matter/ha (Kays et al., 2008a). Dry matter forage yields ranging from 3 to 30 t/ha have been reported (Seiler et al., 2006; Baldini et al., 2004; Seiler, 1993; Kosaric et al., 1985). Jerusalem artichoke tubers can be harvested once the leaves have dried, from late summer-early autumn (September or October) to spring (in regions where the soil is not frozen). In subtropical areas, the tubers should be removed from the ground within a month as they may rot relatively rapidly. The stems should be cut prior to tuber harvest. Tubers yields of 16-20 t fresh matter/ha were reported in the 1980s. In Canada, in 2008, average yields of 41.4 t/ha were reported and, in France, up to 50-70t/ha (Kays et al., 2008a; Agrice, 1998). Tubers can be directly dug up and consumed by pigs that can strip-graze once stems have been cut. However this should not be done under rainy conditions as pigs may damage the soil (Pousset, 2010; Kays et al., 2008b). 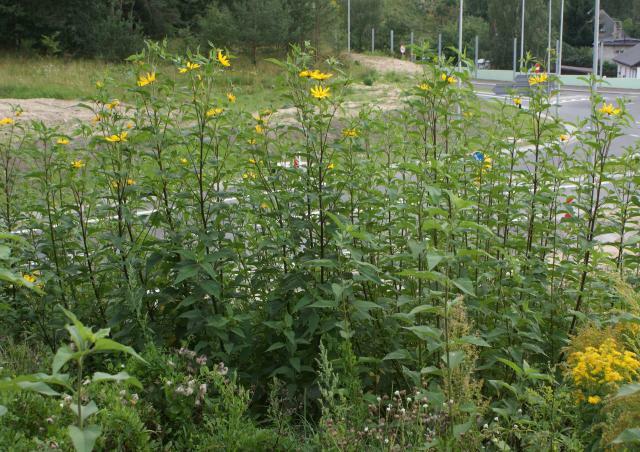 The Jerusalem artichoke competes strongly with other plants as it quickly and densely shades them and competes for nutrients (FNA, 2006; Duke, 1983). For example it may help in getting rid of quackgrass (Elytrigia repens), a troublesome perennial weed in many crops (OARDC, 2011). However, its aggressive growth habit coupled with easy propagation through spreading rhizomes and its perenniality make it a potential weed in the subsequent crop. Remaining tubers in the field have been shown to reduce maize grain yields by 25% and soybean seed yields by 91%. Tilling in the early summer as well as frequent mowing of the tops for 2 to 3 years can help to weaken the weed potential of Helianthus tuberosus (Swanton, 1994). The Jerusalem artichoke can be grown in marginal lands and on saline soils. It was recommended in the 19th century in New Zealand for sand-land afforestation as it provides shade to tree seedlings in their early stages of development (Whitcombe, 1872). It has potential for soil reclamation in disturbed industrial sites where its root system helps degrading organic and inorganic contaminants (AITF, 2011). The aerial part of the plant contains different proportions of stems, leaves and flowers according to the period of harvesting. The leaves have a higher protein content while the stems contain more cell wall components. Therefore, the composition of aerial parts of the Jerusalem artichoke varies widely. The protein content can vary between less than 5% to more than 23% DM (Rawate et al., 1985; Seiler et al., 2004; Seiler et al., 2006; Ignatova et al., 2007; Kays et al., 2008b; Karsı et al., 2009; Terzic et al., 2012). It decreases when harvesting is delayed. The essential amino-acid composition of leaf proteins is similar to that of cereal grains but is richer in lysine (Rawate et al., 1985). 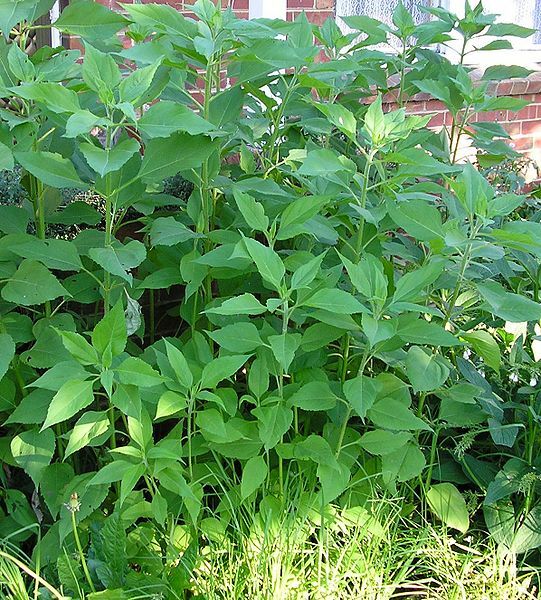 The cell wall and lignin contents of Jerusalem artichoke foliage increase during vegetative growth. The NDF content varies from less than 30% to more than 50% DM (Rawate et al., 1985; Lindberg et al., 1986; Kays et al., 2008b; Karsı et al., 2009). Jerusalem artichoke tubers have a high carbohydrate content but relatively low contents of protein and fibre. The major reserve carbohydrates are fructosans (50% DM), especially inulin, and sugars (27% DM) (Hindrichsen et al., 2004). Inulin is a valuable fructosan that has beneficial effects in monogastrics (Kays et al., 2008b). Inulin resists enzymatic degradation but ferments readily in the large intestine and is beneficial to gut health (Blair, 2007). The protein content of tubers varies from 5 to 12% DM. The protein contains four times the amount of sulphur amino acids and over twice the amount of essential amino acids as chicory roots and potato tubers (Cieslik et al., 2011). The crude fibre of the Jerusalem artichoke tubers content is low, from 4 to 7% DM, and the NDF content is about 9-10% (Hindrichsen et al., 2004). The leaf protein extraction residue contains 12% crude protein and 28% crude fibre, and may be suitable for feeding to ruminants and rabbits (Rawate et al., 1985). Metabolizable energy was about 8.7 MJ/kg DM (NDF 48% DM) in foliage harvested in mid-October (Lindberg et al., 1986). Net energy for lactation was 5-6 MJ/kg DM for forage harvested late in October prior to tuber harvesting. The latter values were similar to the ones obtained on sunflower green fodder (Petkov et al., 1997a). Cell wall and lignin of the green foliage increased the proportion of rumen undegradable fractions and thus decreased the DM and OM rumen degradability (Lindberg et al., 1986), as well as the in vivo OM digestibility (Petkov et al., 1997a). At the flowering stage, the whole plant showed an in vitro DM digestibility of about 60% that was lower than that observed for sunflower forage (Seiler, 1993). The substitution of alfalfa by up to 30% of Jerusalem artichoke foliage at full bloom did not affect the in vitro digestibility of the diet (Fazaeli et al., 2009). Rumen nitrogen degradability of Jerusalem artichoke fodder depends on the stage of maturity. Reported values for the effective degradability of N were about 67% for the whole plant, i.e. around 90% of that of alfalfa (Lindberg et al., 1986) and 65% for Jerusalem artichoke leaves, similar to alfalfa (Ma et al., 2010). Compared to maintenance requirements of ruminants, the mineral contents of Jerusalem artichoke forage at the flowering stage appear adequate for Ca, Mg, K, but inadequate for P, and excessive in terms of the Ca:P ratio (Seiler et al., 2004; Seiler et al., 2006). Few studies have investigated the effect of feeding Jerusalem artichoke forage on animal performance. Moreover, because of the high variability of its composition and nutritive values, recommendations for its utilization as green fodder for ruminants can differ greatly. Jerusalem artichoke can be either regarded as fully suitable for intensive feed production (Nadezhkin, 1997) or only used as a supplement (Petkov et al., 1997a). For dairy cows, fresh Jerusalem artichoke tends to increase lactose and fat contents in the milk, but should not be included at more than 20 kg fresh material (6-7 kg DM) per day (Kuppers-Sonnenberg, 1977). In field trials, Jerusalem artichoke forage was either completely or nearly completely rejected by grazing lambs when compared to other perennial grasses (Marten et al., 1987). For roe deer, the quantity of Jerusalem artichoke fodder should be limited in practice (Ma et al., 2010). The mineral content of Jerusalem artichoke varieties (especially sulphur, molybdenum, chlorine and lead) and the total phenol content of leaves could influence the feeding preference of fallow deer (Gleich et al., 1998). The aboveground parts of Jerusalem artichoke can be stored as silage for winter feeding, which is more palatable than dried forage (Kays et al., 2008b). However, Jerusalem artichoke silage contains less nutrients, and in vitro organic matter digestibility and energy values are lower compared with the fresh plant. For this reason Jerusalem artichoke whole plant is regarded as a green forage, which can be ensiled if necessary (Karsı et al., 2009). Addition of 5% molasses into the green mass improved fermentation and increased digestibility of the Jerusalem artichoke silage (Bingöl et al., 2010). When molasses is added to the Jerusalem artichoke silage, dry matter intakes were higher than that would have been predicted for other grass silages of similar composition (Hay et al., 1992). The energy and nitrogen digestibilities of Jerusalem artichoke tuber meal measured in dairy cows were 73 and 62% respectively, and the net energy for lactation was 5.5 MJ/kg DM (Zhao et al., 2011). In sheep, a much higher net energy value of 7.7 MJ/kg DM (ME 12.7 MJ/kg DM) was recorded, comparable to that estimated for root crops such as fodder beets (Petkov et al., 1997b). Effective rumen degradability of the tuber nitrogen is very high (almost 80%, Chapoutot, 1998). The NDF undegradable fraction is lower than 30% (Chapoutot et al., 2010). The fructosan fraction is highly fermentable in the rumen, more so than cellulose, starch and pectins, resulting in a higher in vivo and in vitro digestibility compared to other feeds rich in starch or fiber, but also in higher methane emissions (Hindrichsen et al., 2004; Hindrichsen et al., 2005). Tubers induced the highest volatile fatty acids and lactate accumulation, with the largest drop in pH (Vervuert et al., 2005). The K:(Ca+Mg) ratio of Jerusalem artichoke tubers is more than twice higher than the prescribed ratio for cattle feed (Terzic et al., 2012). The high content of potassium could explain the higher urine volume observed when increasing the inclusion rate of tubers in the diet (Hindrichsen et al., 2006). Inversely, the Ca:P ratio in tubers (about 1:1) corresponds to the desired ratio for cattle feed, contrary to the leaves that contain much more Ca than P.
When included up to 30% in the diet of dairy cows, the Jerusalem artichoke meal did not change significantly milk yield and milk component contents (Zhao et al., 2011). In dairy cows, using Jerusalem artichoke tubers as a concentrate in a forage/concentrate (1:1) diet caused higher urinary energy loss but better energy utilization compared to soybean hulls, and did not result in clear differences in energy retention (Hindrichsen et al., 2006). In growing steers, Jerusalem artichoke tubers could substitute for 20% of steam-flaked maize without altering DM and protein digestibility and nitrogen retention (Bramble et al., 2000). There is a long tradition of feeding pigs with Jerusalem artichoke tubers. It was noted in the early 20th century that those "tubers have been recommended for feeding hogs and have been more used for this than for any other purpose" (Shoemaker, 1927). They are relished by pigs, who are effective left-over tubers removers after harvest (Wunsch et al., 2011; Shoemaker, 1927), and have been a recognized substitute feed for pigs in times of potato shortages (Dijkstra, 1937; Scharrer et al., 1950 cited by Kays et al., 2008b). 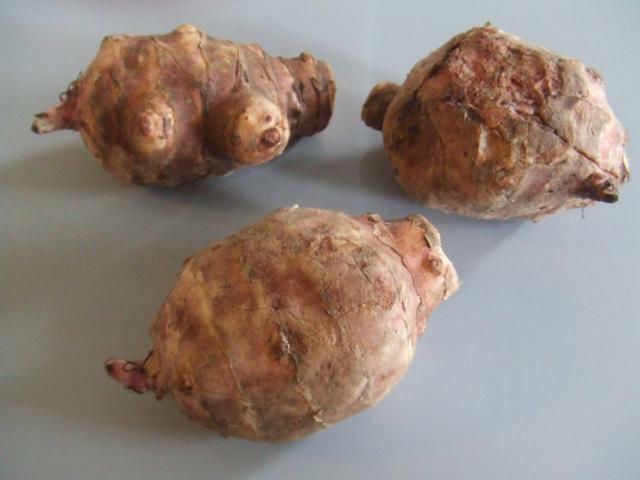 Since the 1990s, many studies have investigated the use of Jerusalem artichoke tubers in alternative pigs diets such as those for organic or outdoor pig farming (Jost, 1995; Jost, 1992; Stoll, 1992). Jerusalem artichoke tubers are a carbohydrate-rich feed and thus have a high metabolizable energy content (about 14 MJ/kg DM), though this value is lower than that of maize grain. Their main drawback is their low protein content (about 8% DM), which makes protein supplementation necessary when the tubers are a major component of the diet (Jost, 1992). The tubers are less recommended for young animals than for older ones. In young pigs, tubers substituting for more than 30% of maize grain depressed feed intake, daily weight gain and feed conversion, possibly due to bulkiness and digestion patterns (Piloto et al., 1998). It was also noted that growing pigs under 50 kg cannot not fully benefit from Jerusalem artichoke tubers because they find them hard to chew (Jost, 1992). In a comparison between young (20 kg) and older pigs (50 kg) where tubers substituted for cane molasses, nutrient (except fibre) and energy digestibilities decreased with increasing levels of substitution, but were still much higher in older pigs. It was, therefore, concluded that high amounts of Jerusalem artichokes were better tolerated by older animals. Nutrient digestibility was also higher with tubers than with molasses in 50 kg pigs (Macias et al., 1998). It was thought that pigs could adapt their consumption pattern over time, so that they can get as much energy from Jerusalem artichoke tubers as from maize grain (Ly et al., 1994). Jerusalem artichoke tubers were found to be a particularly good feed for animals in the late fattening stage and for pregnant sows (Iannone et al., 2003). Animals over 50 kg, and sows in particular, readily root for the tubers but this should be restricted to no more than two hours a day in order to prevent field exhaustion (Jost, 1992). Allowing pigs to graze on grass and Jerusalem artichoke tubers has a beneficial effect on animal well-being and meat quality but may also induce parasitism, requiring anthelmintic treatment (Stoll et al., 1995; Dufey, 1995). Because of the positive effects of inulin on gut microflora, Jerusalem artichoke tubers have been regarded as a possible alternative to antibiotics in pig feeds (Blair, 2007; Sods, 2003). Fresh Jerusalem artichoke tubers or tuber flour (from cooked and spray dried tubers) had beneficial effects on pigs manure odours that smelled sweeter and had less of a skatole smell when they were included at 3 or 6% dietary level in pig diets (Farnworth et al., 1995; Farnworth et al., 1993). Jerusalem artichoke tubers are therefore worth using in pigs feeding as they may improve animal health (probiotic effect), animal welfare (preventing stereotypic behaviour) and reduce the environmental impact of pig farming (Blair, 2007; Stoll et al., 1995; Farnworth et al., 1993). Poultry should be fed dried Jerusalem artichoke tubers, as fresh tubers contain only 30% DM and are therefore not a convenient ingredient for poultry feeds. In broilers, Jerusalem artichoke tubers seem to have a positive effect on gut health, therefore acting as a prophylactic feed ingredient (Kays et al., 2008b). Adding Jerusalem artichoke tuber syrup in drinking water had a positive effect on gut ecology and on broiler growth (Kleessen et al., 2003). A similar trend was observed with broilers fed small amounts (up to 4%) of tuber powder, which improved slightly (although not significantly) feed efficiency (Katiyanon et al., 2006). Dried and ground tubers have been tested in laying hens at the 5 and 10% level without degrading feed intake, egg production and egg characteristics (Yildiz et al., 2006). The dried fibrous residue of leaf protein extraction could be easily included as a fibre source in complete rabbit feeds (Castellini et al., 1989). Kays, S. J. ; Nottingham, S. F., 2008. Chapter 6: Value in human and animal diets. In: Kay, S. J.; Nottingham, S. F., Biology and Chemistry of Jerusalem Artichoke Helianthus tuberosus L.